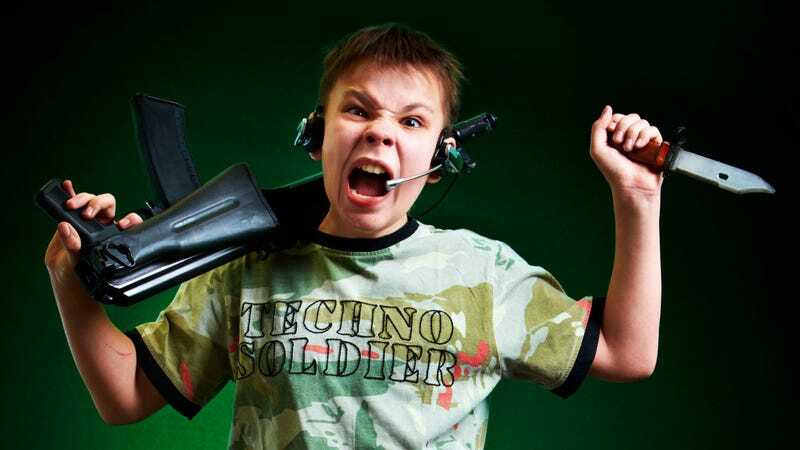 Fake Gamer of the Week: Why Can't Techno Soldier Control His Rage? What made Techno Soldier so angry? Was it an unfortunate round of Call of Duty? Did someone call his mother nasty names? Is he cosplaying the angriest bird? The mainstream media might tell you that violent video games cause this kind of behavoir, but I believe I've discovered the true culprit: green and black backdrops. I'll go ahead and say it: green and black backdrops (or black and green, in Europe) are the biggest threat to the innocence of our planet's youth. It's a controversial stance, and an unpopular one at that. Within an hour this article's comments will be filled with angry reactions from the pro-bleeners. I'm fine with that, as long as the discussion is kept civil. That having been said, I've a feeling the banhammer will get a workout today. Where's the proof, you ask? Here is a scientifically-taken photo of Techno Soldier before the application of a green and black backdrop. He's holding a machine gun, yes, but he has not fired, despite the fact that his monitor is broken, someone tossed random video game and computer equipment on the floor, and he looks to possess the world's saddest teddy bear. Now let's apply a green and black backdrop. Photo credit: (C) Andrey Armyagov / Stockfresh.